2018 is in the books! We hope you had as much ultimate fun as we did, and an even more ultimate 2019! Happy New Year! My name it's Alejandra Ospina Orozco , I'm from Manizales, Colombia. I play ultimate for team Revolution since 2017. Let's get right to it - you recovered from 6 years of injuries?! It's a really long story but in March of 2010, I was doing tryouts for my university team, in a defense test I turned around and layed out backwards. I blocked the disc but fell really bad on my wrist. When I went to the doctor, he said it was a sprain. I wore a cast for a month, then started physical therapy, but I was still in pain. After 8 months, they told me I needed surgery for "Carpal Tunnel". I started looking with my parents for new advice, and had many exams. The results showed that I had about 16 injuries in different parts of my wrist and thumb. I spent almost 8 months looking for a hand surgeon, because when the orthopedist saw the results they thought it's a risky surgery and that I wouldn’t be able to move my hand again in a proper way. We finally found a guy in Cali, a city that is 3.5 hours from home. I started going there every week till they could perform the surgery. The pain was awful and I was on serious pain killers for more than 2 years that made me hallucinate and didn’t take away all the pain. After the surgery, the recovery was slow and painful. It took 2 years for me to write again and 3 years to be able to try play Ultimate and rock climb again. The pain with ultimate I couldn’t manage at the moment, but climbing was way easier. I don't know why, because actually it's a really demanding for my hand, but I can’t lie it took me like 1.5 years trying to climb almost every day to start feeling strong with my hand and improving my skills. It was a really frustrating journey. Climbing was really natural for me because my parents are climbers, and they started bringing me to the mountain and climbing walls since before I can remember. I tried Ultimate again because I really love it, but I was in serious pain for months. In 2015, I was in Bogotá, and talking with one of my friends he told me they were in nationals at the moment and I went by to watch some good ultimate. I think it was the first time in 2 years that I saw ultimate, because I just feel really bad, sad and depressed knowing I wasn't able to play, that I couldn’t even watch it. Then in 2016, I said this will be my 3rd and last try - if I make it I will play Ultimate again, if I don't I will quit and that’s all. I relearned to throw again in a way that didn't hurt my wrist. Throwing that way, it was hard to manage my strength. One day, I was throwing with my sister and I threw a flick.I broke 2 metacarpals! After that I felt really frustrated, and my main objective became to learn to throw again. 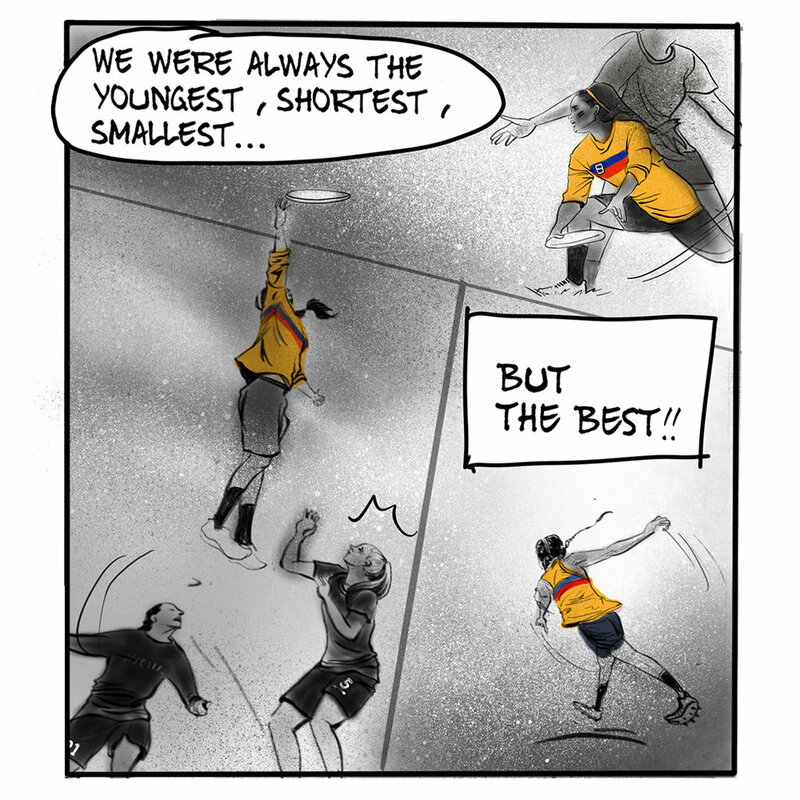 I started in the World Games process for the Colombia team in 2017, and during that process I met amazing people that helped me a lot and motivated me everyday to work harder. What's your role on the field? Defense FTW all way it's my favorite, and usually I am a cutter. How do you train with team Revolution? Well it's kind of hard since I don't live in Medellín, every week Moore sends me a training plan that I do. I also train with some teams from my city (FlyOver, Dracos, Minokawa and Seleccion Caldas) and do other things by myself. The training plan includes basically body conditioning for the gym and track. I also try to do at least one hour of throwing every day and do field work 3 to 5 times per week. That way, when I meet with the team I can be in good shape, and I visit them once or twice month. How did it feel like playing with Revolution at your first Worlds Championship? Wow! It's incredible, I never expected to live something like this, with all the games and all the people involved in WUCC 2018. Now in sports it is my most valuable experience so far. Moore, Wara and all the girls are amazing people full of good things and love. 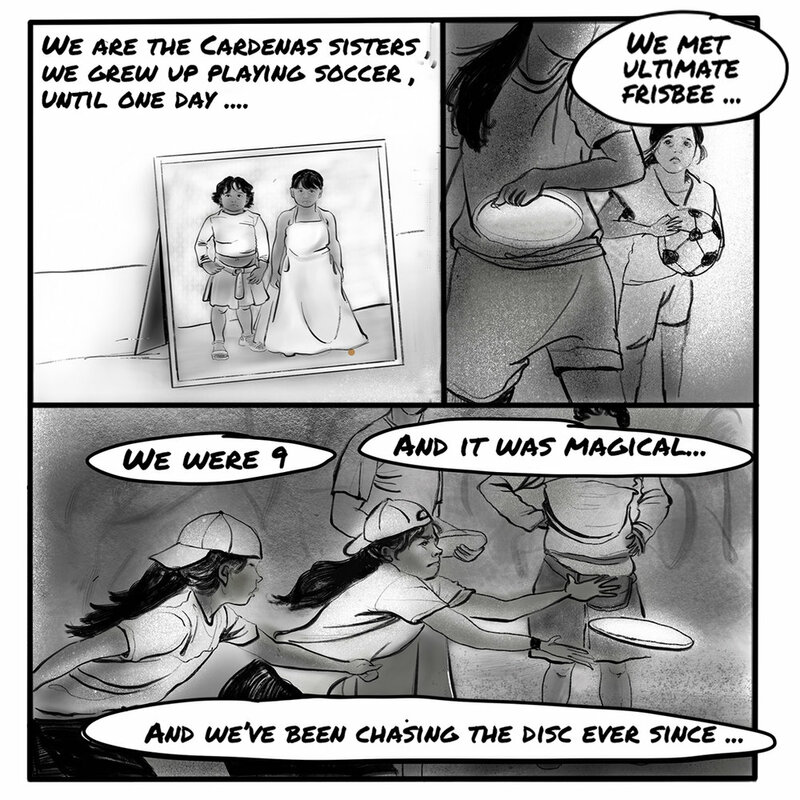 It feels like a big family, and also the most professional ultimate players with awesome skills, really athletic and with mental toughness, those are our main characteristics. What do you like the most about your Greatest Bag? The isolated pocket that lets me keep my drinks cold, I hate when I finish training and everything is melted. To celebrate, we've made brand new, EXTREMELY LIMITED EDITION custom WFDF event bags, that will be on sale at WFDF 2018 World Ultimate Club Championships, World Masters Ultimate Club Championships and World Junior Ultimate Championships this summer. Or, you can beat the rush and be the first to snag your event bag, by ordering here.